Did you know that March 14 is National Potato Chip Day?! 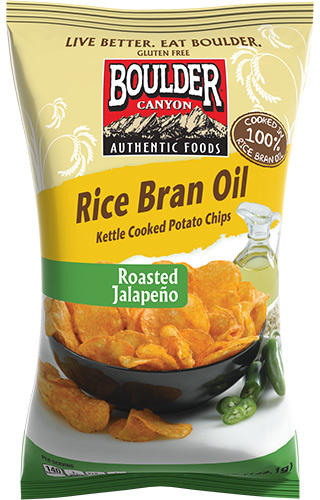 Boulder Canyon, the leading better-for-you snack brand, is celebrating with the launch of our new Rice Bran Oil Kettle Cooked Potato Chips! Just like the rest of our products, Boulder Canyon Rice Bran Oil chips are Certiied Gluten-Free, Non-GMO and don’t contain any trans-fat, MSG or cholesterol.